It sounds so loud, it sounds so plain. Oh, God said to Abraham, "Kill me a son"
God say, "No", Abe say, "What?" Well, Abe says, "Where do you want this killin' done?" God says, "Out on Highway 61"
He asked poor Howard, "Where can I go?" Howard said, "There's only one place I know"
Sam said, "Tell me quick, man, I got to run"
And said, "That way down on Highway 61"
Do you know where I can get rid of these things?" And Louie the King said, "Let me think for a minute son"
Just take everything down to Highway 61"
"My complexion", she said, "Is much too white"
Let me tell the second mother this has been done"
And have it on Highway 61"
You could stop a clock." He says, "Lord this must be my destination." Said "Boy you're gonna be president." On July 31, 2003, John Mellencamp performed the complete album for a rapt, sold-out audience at New York’s Town Hall. For the concert, Mellencamp was joined by the same musicians who recorded the studio album with him: Mike Wanchic (guitars), Andy York (guitars), Miriam Sturm (violin), Dane Clark (drums), John Gunnell (bass) and Michael Ramos (keyboards). They also performed stripped-down versions of Mellencamp’s “Small Town,” “Paper In Fire” and Pink Houses,” as well as Bob Dylan’s “Highway 61 Revisited” for the intimate audience of 1,500 people, which included members of Woody Guthrie’s family. 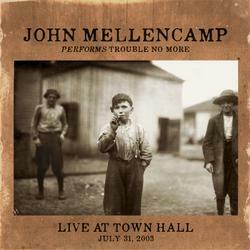 John Mellencamp Performs Trouble No More Live At Town Hall was recorded by Kooster McAllister (Record Plant remote truck), produced by Mike Wanchic, mixed by Paul Mahern and mastered by Gavin Lurrsen. The CD and digital audio packages both feature the complete 15-song concert, while the vinyl LP highlights 10 performances from the show. All three configurations include a new liner notes essay by Bob Merlis.